There’s a quiet automobile revolution going on in Norway that will likely make life a lot easier for visitors renting cars who never learned how to drive with a clutch and manually shift gears. More and more new cars are now being sold with automatic, prompting industry experts to predict that manual transmissions will disappear over the next several years. Automatic transmissions have been standard on cars in, for example, the US for decades. It can cost extra and involve delayed delivery if car customers specifically want to shift their own gears while driving, and most all driver education programs use cars with automatic. It’s thus been a big challenge for many foreigners in Norway and elsewhere in Europe to rent a car or drive a company vehicle. The vast majority still have manual transmissions, so if you don’t know or remember how to clutch and shift gears, you may not get very far. Rental and new cars with automatic gears also have a tendency to be more expensive, the opposite of the situation in North America. Now increasing numbers of cars in Norway are being sold with automatic transmissions as standard, if featured, equipment. “Something happened when it became so popular to drive a Tesla,” mused Sindre Almsengen, a driving instructor at the Oslo Vest Trafikkskole, to newspaper Aftenposten. The expensive electric car that took Norway by storm several years ago, and all those that have hit Norwegian roads since, don’t have a motor and therefore no gear box. They also offer all kinds of automatic functions that suddenly were both cool and welcome. 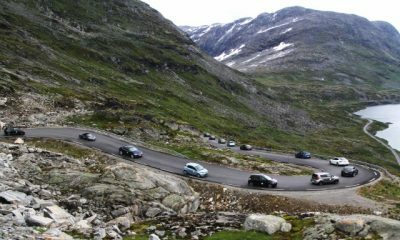 The trend has spread all over Norway, according to Ellen Ramstad of the driving school’s trade association Autoriserte Trafikkskolers Landsforbund (ATL). “We have the impression that there’s a steady increase in the numbers of people learning to drive in cars with automatic,” Ramstad said. The need for manual transmission expertise will decline steadily in the years to come, predicts Anders Hovde at analysis firm TNS. “The majority of new cars sold now are automatic,” Hovde said. Norwegian drivers tend to love the transition to automatic, with one student even claiming she could pay more attention to traffic than to clutching and shifting gears. New technology will also continue to affect driving until the day comes when cars drive themselves. “Within 15 years, it will be unnecessary for most folks to have to shift gears,” Hovde predicted. And that will be a great relief for many American tourists at local rental car counters as well.